All regular readers to the Preserve have probably caught on by now that I'm not always as quick as I'd like to be getting galleries posted. There are sadly only so many hours in the day, and so very many cool products scattered around the archives here, that making those two resources come together isn't always as expedient as I might hope. As such, I've had wave 2 of the fantastic new Pursuit of Cobra figures sitting here patiently for at least a month, maybe even two months by now, and am finally chewing my way through that backlog. However slow the detailed figure posts may be, I'm doing my best to keep both the current Transformers and G.I. Joe checklists useful and up to date for everyone - so be sure to use them for all of your referencing needs! 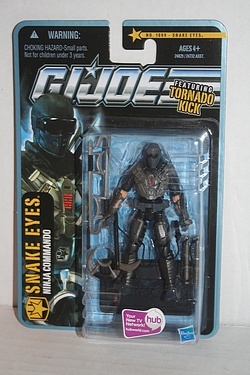 Now that we're all primed and ready, let's take a look at Tornado Kick Snake Eyes. 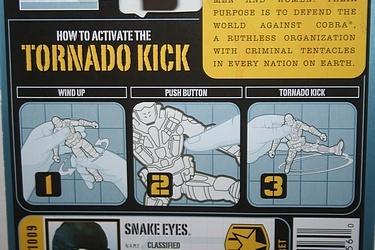 From reading the bio it seems that he is in the Jungle Assault sub-group, but the back of his card sees the standard 'battle' text and diorama picture replaced with a fabulous vintage-feel instruction card on how to properly use his rocking action feature! I think that Hasbro has done an excellent service to fans, knowing full well that this line appeals to both young and old alike. 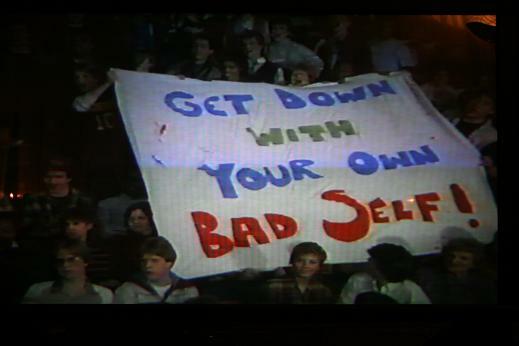 It also may be more penance for the Rise of Cobra line that missed the mark in several ways. 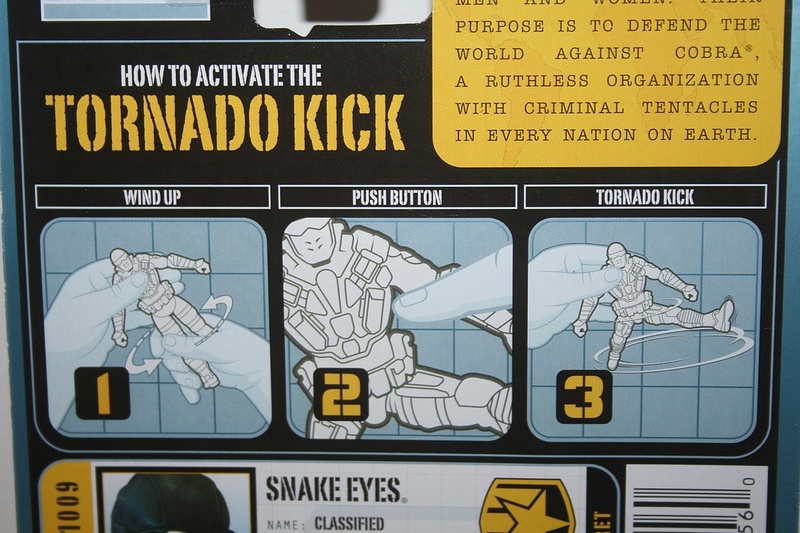 Additionally, while I always will complain about the deluge of Snake Eyes figures that any Joe line brings forth, I can't deny the greatness of a Tornado Kick feature. Who could? !